Geo Chem provides leather, Leather accessories & footwear testing and quality assurance that the product meets the desired global safety and quality standards. It is a platform where retailers, manufactures and importers can verify their products in order to ensure safety compliance and improve quality so that it reduces returns and hence provide satisfied and loyal customer base. Geo Chem evaluates footwear on all the stages from the development to the production, testing the materials and components of the finished goods. In order to market your product as ‘genuine leather’ it is well considered to verify your leather. Geo Chem verifies your product to ensure that the leather is in accordance to the regulation of ISO and EU Standards.There is range of testing on leather like tensile strength, tear strength, flexing test, rubbing test etc. which can define the quality of leather. For footwear, complete shoe flexing, slip resistance test & 16 point bondability test etc. can give an idea for quality of footwear. We provides fashion footwear testing in which it conducts a complete range of tests like slip resistance, heel strength, heel attachment, backpart stability, trim attachment, strap strength and bond test. We provide standard tests to ensure safety legislation and evaluate footwear in different environments. It includes Toe cap resistance, penetration resistance test, electric resistance test, thermal resistance and many more. We also help client to get CE Certified their products as per the PPE guidelines. We provides the test in which the product has to cope with different types of environment so that premature wear could be avoided. We also suggest/advised product improvement wherever needed. For Durability test, we can offer specific ergonomic features test on complete footwear. Geo Chem helps in the testing and identification of restricted substances in the product in order to comply with the customer’s regulatory requirements. 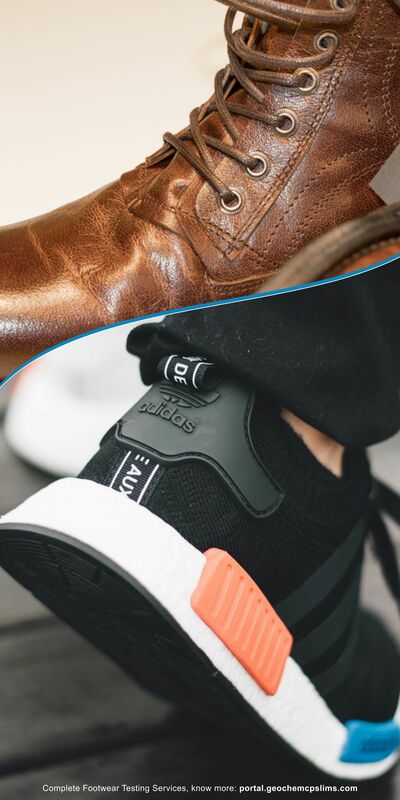 We provide EU directive testing in which we provide composition of the three main parts of the footwear- the upper, the lining and the outer sole so that it reduces the risk of fraud for the consumers and the industry. Mould is a kind of fungus that can create colour change, unpleasant smell, stain and an irreversible damage to the leather, leather accessories and footwear. We provide turnkey and individual test to allow brands and retailers to gain better understanding of mould related issues on their products and raw materials. We provide services which include mould growth resistance of different materials and safety compliance of mould prevention of different chemical agents. We conduct checks at every step of production and delivery as per the compliance. In this segment we provide services such as Initial Product Check (IPC), During Production Check (DUPRO) and Final Random Inspection (FRI). The experts in Geo Chem provides technical consultancy for the product specifications at pre-production stage, technical requirements as per different emerging markets, and store returns. We provide the evaluation of the design of the product so that it can be more comfortable. Foot dimension measurements are the key for footwear design, fit evaluation and clinical application.